My second piece of Kat Von D makeup that I ever bought was the Poetica eyeshadow palette. I remember vividly the moment I bought it - I was on the bus on the way back from town with a friend and I got a reminder on my phone that my bid on eBay for the palette had been out bid and it was ending soon, so whilst on our way home I was glued to my phone and watched the timer tick down - I tried to contain my cheer when I won, failing slightly in the process! Anyway, on to the palette! 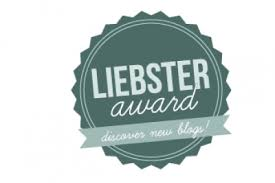 This product is exiting to me for one reason and one reason only - it is the first thing I have ever won in a competition. MUA ran a competition, which if I'm honest I can't even remember what it was or even entering, either way you have no idea how excited I was to see a email pop up in my inbox from MUA telling me I had won a Glamour Days palette! It took a few weeks to arrive, but when it did I excitedly tore open the package to reveal the palette I had won. 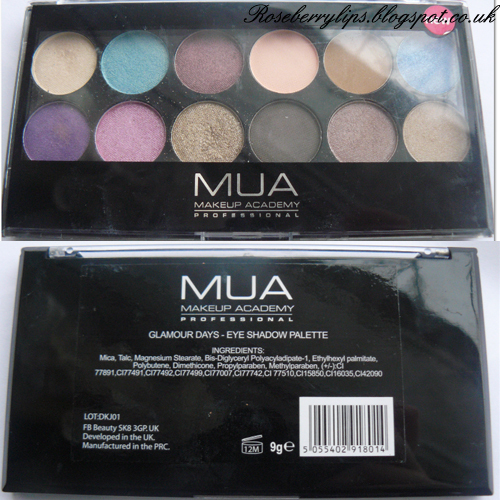 Just like most MUA products, the palette is in a black plastic palette with a clear lid so you can see the colours inside. As well as that, just like most of MUA's range, the shades don't have names - and in this case not even shade numbers which I think is a shame. It is incredibly useful to a lot of people when companys give their products/shades names or shade numbers as it helps when doing looks with the products or discussing them with somebody. Kat Von D's makeup is my absolute favourite makeup out there, and as I have said before, it's such a shame that it's not avaliable in the UK as we don't have any Sephora stores, and the online store doesn't ship to England, so we have to rely on eBay to get our hands on some, and even then it's very pricey plus shipping costs. 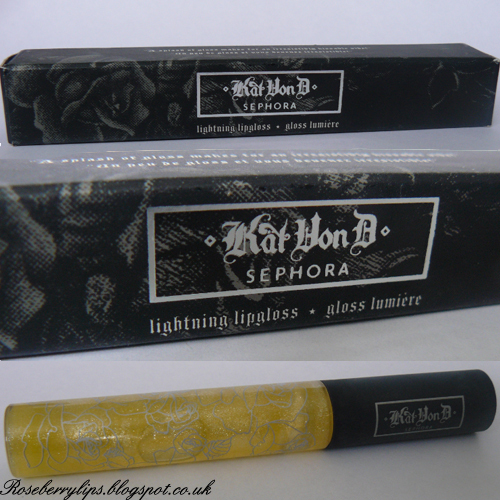 But one of the products I was able to get me hands on was the Kat Von D lipgloss in the shade 'Hustler'. The lipgloss comes in a beautifully designed cardboard box designed by Kat herself. Like most of her products it has roses all over it in a dark grey, and beautiful letting on the box. The lipgloss itself is safely kept inside and looks like a deep yellow with glitter in it when in the tube. Kate Moss for Rimmel. Shade 110. 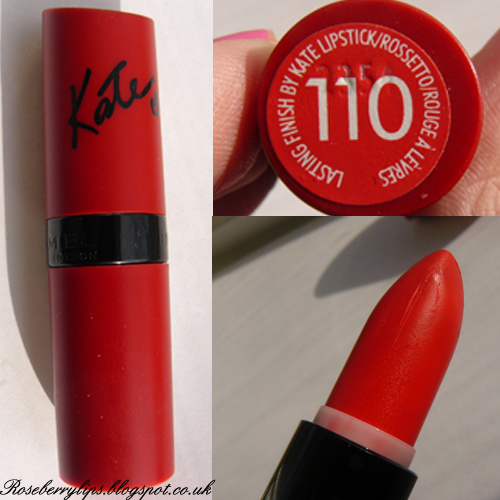 I have been wanting to try the Kate Moss for Rimmel lipsticks for a while now as I had heard a lot of good things about them. But as always with lipsticks, I never know what shade to get! I always try and get something different but I always end up with the similar tones and shades - pinks and reds. So this time, when I was making the most of the 3 for 2 offer at Boots, I finally took the plunge and picked up a lipstick in a shade totally out of my comfort zone - a bright orange based coral lipstick in the shade 110. The lipstick comes in a bright red bullet with Kate Moss' name written on the lid with a cute heart next to it - I think the red cases are the matte lipsticks and the black cases are the shimmery ones, I wouldn't say for certain though. Anyway, this shade is simply beautiful and I'm so glad I picked it up. This lipstick also smells different - it doesn't smell like a normal lipstick to me, it smells fruity - but an artificial fruit smell. I have found that with lipsticks as another lipstick from Rimmel that I have (Amethyst Shimmer) has an artifical raspberry scent to it, so this must be a running theme with Rimmel products. The smell isn't strong though and doesn't last so you don't have to worry about it too much. I always have been and always will be a Barry M fan. 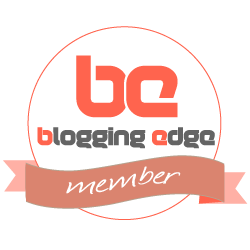 I just love their products - especially their nail paints! From my experience, I have found them to be amazing quality and are such beautiful colours. At the minute I am loving their pastel range - in particular, Berry Ice Cream - a beautiful light purple/lilac shade. I really like the Barry M bottles - they are thick glass and square which makes them very easy to store as they can clean against each other whilst making sure the nail polish is safe inside. The shades are printed on the bottom clearly, as well as the bottle being clear so you can see the exact shade inside. Unlike some nail polishes, I have found that the Barry M Nail Paint applies the same colour as it appears in the bottle - some nail polish brands sometimes appear different on the nail than when they are in the bottle, and this can lead to disappoint, especially if you are looking for a specific colour. But Barry M make sure that the colour you see is the colour you get, which I think is fab! 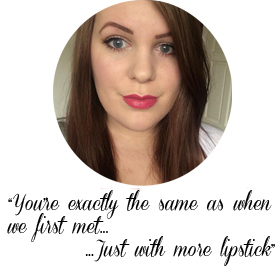 It's no secret that i'm a fan of lip products - but considering I wear A LOT of lipsticks (on a daily basis! ), I always make sure to moisturise my lips to make sure they don't dry out or crack or anything like that, so a big staple in my bag is lip balms. 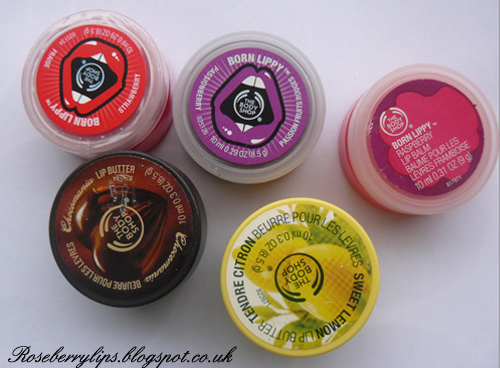 My favourite brand of lip balm being The Body Shop! 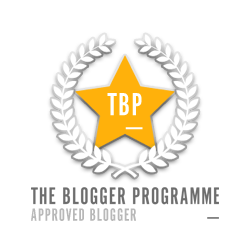 On to my current collection of their lip balms and lip butters..
Last month I decided it was about time to invest in a new blusher - I was bored of my current ones, and they weren't very Summery. (Summer, in England? I know.. Atleast i'd be able to feel Summery though, right?) 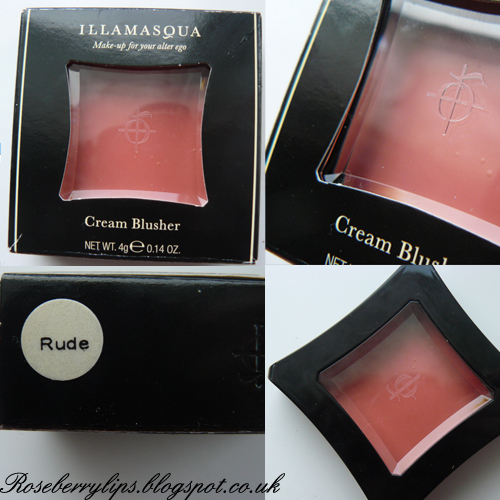 Anyway, I was originally going to get a MAC blusher - so I popped over after work but the counter was absolutely packed so whilst waiting for it to get quieter, I wondered over to the Illamasqua counter as it was a lot quieter. I soon got talking to the guy who worked there and he told me to sit in the chair and that he had the perfect blusher for me. He came over and introduced me to Rude - coral toned cream blusher. As with all Illamasqua products - they are packaged securely in black plastic cases within a cardboard box, in a quirky curved square design. They feel and look like expensive products, and they feel strong - so you can carry them around in your bag without having to worry about any spilling or damage to your products (or contents of your bag for that matter). New York Apple is an orange based red (I surprise myself sometimes, I always think I won't suit orange based reds but that's all I seem to buy! Where are my blue based reds hiding?!) 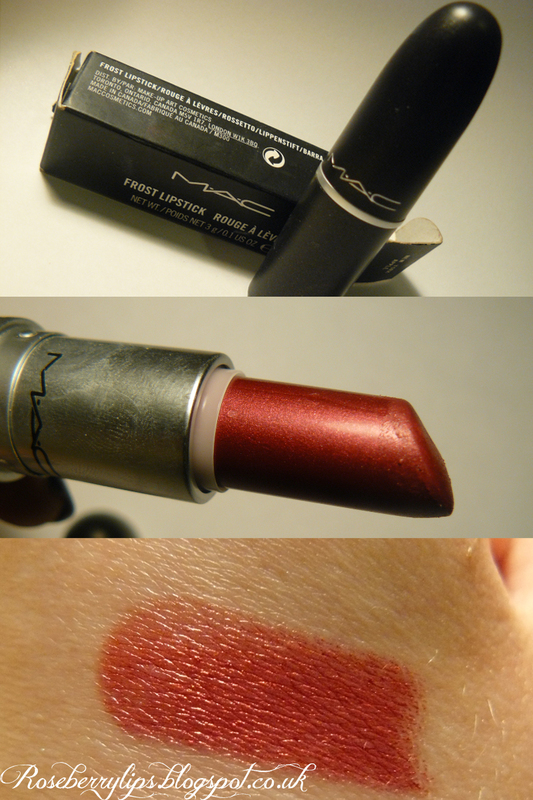 with a metallic finish as it's a Frost lipstick. There is a hint of sparkle running through it which helps give it the metallic finish, and this colour is very wearable, i think it'd suit just about anyone! Just like all other MAC products, it has that wonderful vanilla scent to it and is encased in the famous round black bullet shaped packaging to keep the lipstick protected. The lipstick is very easy to wear and doesn't feel anywhere near as drying as the Satin finish did (like my MAC Rebel lipstick).